Samsung Galaxy Note 2 VS iPad Mini may seem like an odd couple for many people, thinking that they are two different devices and out of each other’s league. If you keep an eye on the mobile market, you will easily find that smartphone and tablet PC markets, instead of being separated as before, are getting ever closer, with handsets touting larger displays while the tablets becoming smaller. Under such circumstances, Galaxy Note 2 and iPad Mini could be mentioned in the same breath. Will the Korean phablet or the diminutive Cupertino tablet be the right one for you? 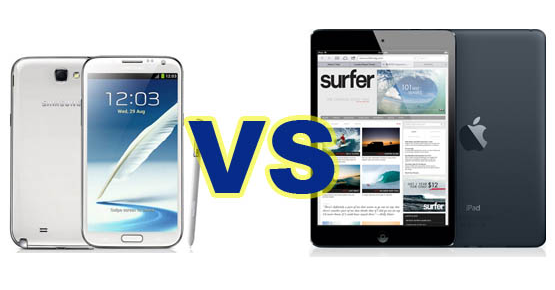 A detailed Samsung Galaxy Note 2 VS iPad Mini review is made here, helping you better understand the two powerful gadgets. Samsung Galaxy Note 2 features a 5.5-inch Super AMOLED HD display, coming with 1280x720 resolution and 16:9 aspect ratio as well as delivering an immersive and enriched cinema-like video viewing experience. Like its predecessor, Galaxy Note 2 is fully compatible with Samsung’s S pen stylus, allowing users to draw and write directly on the screen. iPad Mini, in contrast, has a bigger display at 7.9 inches, featuring the resolution of 1024x768 pixels. The display employs IPS LED screen, offering users with stellar viewing angles and working well in direct sunlight, so it is ideal for users to play Hollywood movies thereon. If you are longing for the crisper and clearer display, the smaller Galaxy Note 2 would be better, while if you are a widescreen enthusiast, iPad Mini would be your solid choice. The Galaxy Note 2 runs on Android 4.1.1 (Jelly Bean) and recently the South Korean mobile manufacturer has released Android 4.1.2 software upgrade for the device. The platform allows users to access to the Google Play Store where they’ll find hundreds of thousands of apps, widgets, games and other media to allow them to get the most out of their device. The iPad Mini is armed with iOS6, the latest version of Apple’s ground-breaking mobile platform. Similar to the fourth-generation iPad, it comes with the new Maps application, Siri, Facebook integration and more. But different from iPhone 5, iPad Mini does not access to any official Youtube application which was taken away from iOS6. The Galaxy Note 2 employs a cutting-edge quad-core Cortex-A9 processor, which is the same processor that powers the third generation Galaxy S series smartphone. However, the key difference is that the quad-core processor in Galaxy S3 runs at a clock speed of 1.4GHz, while the Galaxy Note 2's quad-core processor is clocked at nippy 1.6GHz, offering users with a faster browsing and video playing experience. On the other hand, iPad Mini features Apple A5-dual-core processor, the same processor powering the iPhone 4S and ipad 2. While providing blazing battery life, this processor makes web surfing, photo editing, game playing and video watching smooth and terrific. The Galaxy Note 2 runs on a 3100mAh battery, enabling users to enjoy multimedia content on the move in spite of location and time, even without suffering from power limitation. A talktime battery test (in 3G mode) reveals that the Note 2 is able to last up to approximately 17 hours and deliver a web browsing life of up to eight hours and 48 minutes. The iPad Mini promises 10 hours of Wi-Fi web surfing and video watching and 9 hours of cellular web surfing as the iPad 2 and the iPad 4. So you can play games, watch videos, browse webpage, read e-book, etc, on this gadget as you like. Samsung Galaxy Note 2, supporting 4G LTE and HSPA+, is available on AT&T, Sprint, T-mobile, U.S. Cellular and Verizon. Sprint is selling the phablet for $299.99, AT&T and U.S. Cellular selling for $300. T-Mobile is selling the phone for $369.99 with a two-year service agreement. Apple claims the iPad Mini is sold at lower margins than some of their other product lines. iPad Mini with Wi-Fi models is available now. The retail price of $329 (US) is suggested for 16GB model and $429 (US) for 32GB model. It is certainly of higher value than many other-sized tablets. The Samsung Galaxy Note 2 and iPad Mini, even though different from each other, seem like a Roland for an Oliver through this Samsung Galaxy Note 2 VS iPad Mini review. Whichever you like, one thing for sure is that both Samsung Galaxy Note 2 and iPad Mini offer users splendid visual experience. If you want to make the best of the two gadgets, such as importing your favorite DVD movies to Samsung Galaxy Note 2 or iPad Mini for enjoyment at will, MacX DVD Ripper Pro provides a handy solution to rip and decrypt DVD to MP4, AVI, FLV, H264, etc, which can be smoothly played on iPad (iPad Mini included), iPhone (iPhone 5 included), Surface, iPod, Goodle Nexus 7 and so on as easy as pie. 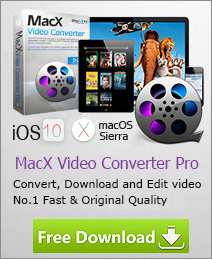 Beyond that, if you are crazy about the YouTube videos and want to download them and transfers to Galaxy Note 2 or iPad Mini, MacX Video Converter Pro would be your good assistant. Besides downloading YouTube videos, you can also use it to convert both SD videos and HD videos like MKV, MOV, FLV, AVCHD and M2TS to your Galaxy Note 2 or iPad Mini for playback in a flash. This article gives tips and tricks to play DVD movies on Galaxy Note 2 with MacX DVD Ripper Pro, with which you can easily rip and convert DVD to Samsung Galaxy Note 2 for watching on the move. Are you intrigued by Samsung Galaxy Note 2? Wanna convert videos to Galaxy Note 2 for watching? Well, this article will show you the tips and tricks on how to convert video to Galaxy Note 2. Just follow four steps, and then you can enjoy videos on Galaxy Note 2 anytime anywhere.